PhotoPhilia Album with thumbnails list, data entry form and the image with captions Rapid viewing for more than 30 popular file formats such as JPEG, Exif, multipage TIFF, PNG, GIF, BMP, PCX, AWD, FPX, PCD, TGA, and multimedia files. Direct RAW format support for Canon CRW/CR2, Nikon NEF, Minolta MRW, Sony SRF, and FUJIFILM RAF. 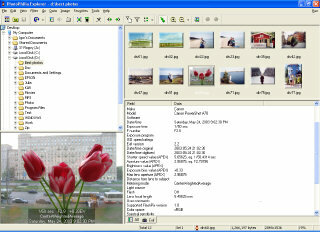 The program can display the RAW files, convert the files to other supported formats (including batch conversion). You can set such preload parameters as white balance, contrast, and other as global or for any RAW file individually. Exif standard support: the program reads Exif data, displays Exif fields as a list or customizable captions, searches for Exif data. 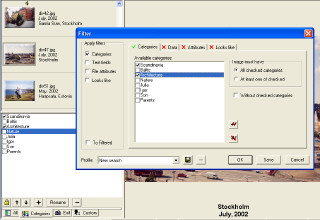 Build-in editor and lossless JPEG transformations preserve Exif data in the file. 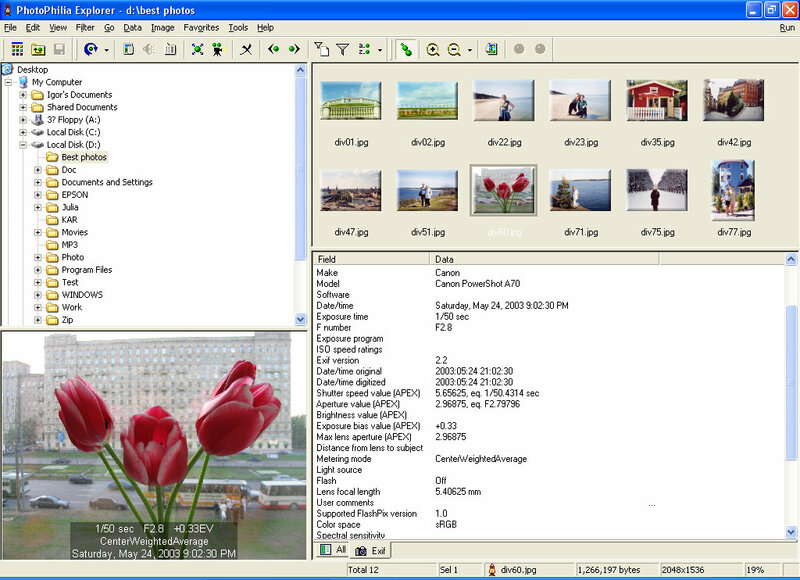 The program also can use the Exif Orientation tag (some digital cameras have an orientation sensor) to correctly display images and auto-rotate them. 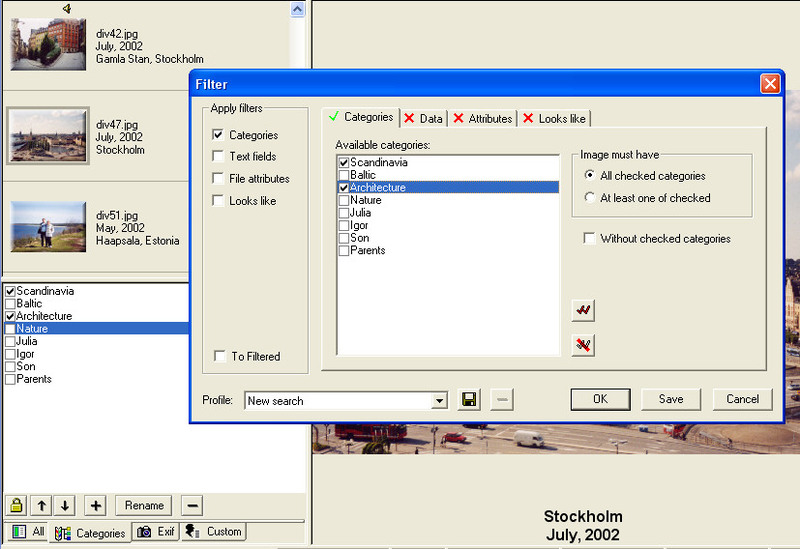 Using a multi-pane Explorer-style layout and familiar concepts such as thumbnails, categories, bookmarks, and favorites, it's quick and easy to find and view images scattered across your hard drives and removable media. The program can scan your hard drives, get images from CDs, removable drives, from digital cameras and scanners (TWAIN) and organize them into albums. It's easy to assign categories, comments, keywords to each photo, and you can search for images based upon these fields, as well as by filename, date, size, Exif data, Looks Like criteria, and custom data. Ideal for taking control of huge collections of images and digital photos, PhotoPhilia uses thumbnail caching, read-ahead logic, and multi-threading to let you move effortlessly through thousands of files. After creating thumbnails of your images, PhotoPhilia lets you browse and search your collection without having to swap CDs or removable disks. 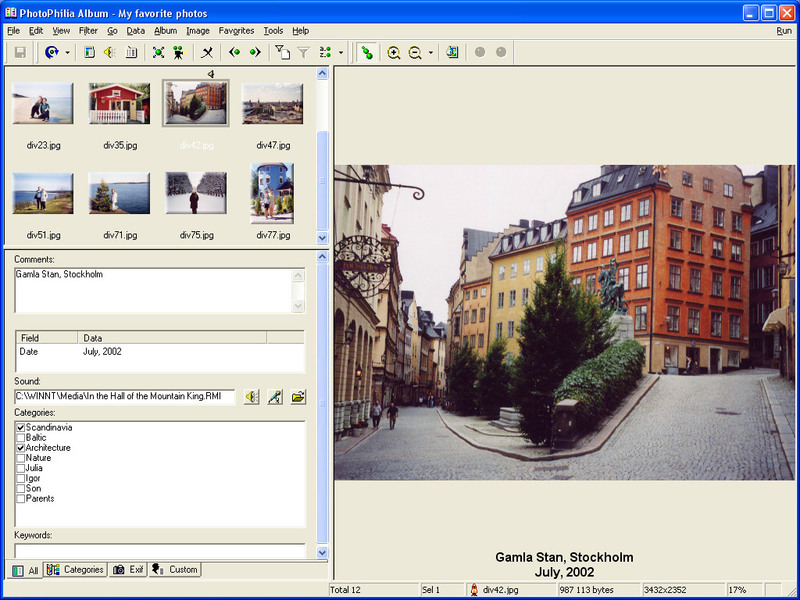 The built-in image editor lets you crop, auto-trim, and resize your images. You can rotate, flip, and skew images, adjust their white/gray/black balance, brightness, contrast, and gamma, remove red eye, and apply a rich set of artistic effects including posterizing, blurring, embossing, solarizing, and more. If you'd like to print your digital photos, PhotoPhilia can easily transform them into stunning printed pages. The program has the ability to print several photos on a single page. Note Blend and Random transitions require MS Internet Explorer 4.0 or higher. The Batch processing tool lets you automate your image processing tasks. In addition to automating file management operations, you can automatically perform the rotating, cropping and apply other image editing effects. PhotoPhilia provides you with a rich set of tools. Actually each tool is a scenario for the Batch processing. You can create your own scenarios, modify existing ones, and export/import them.